“The Jukebox Series” focused on the 80 records that currently inhabit my 1963 Seeburg LPC1 jukebox. I’ve had my jukebox (or as I like to call it “the prehistoric iPod”) for a little over fourteen years and in that time I’d like to think that I’ve perfected the mix of 45s within. Over the years, records have come and gone out of the ranks of the juke, but they were all at one time juke-worthy. I’ve decided to expand “The Jukebox Series” to include many of the “juke-worthy” records that are no longer currently in the mix, but at one time inhabited a coveted slot. The challenge was to memorize every word of this aural history/laundry list of musical groups, radio DJs, songwriters and record labels circa 1974, and be able to regurgitate every nuance at will. Many of my friends were up to the challenge and managed the seemingly impossible feat with ease. 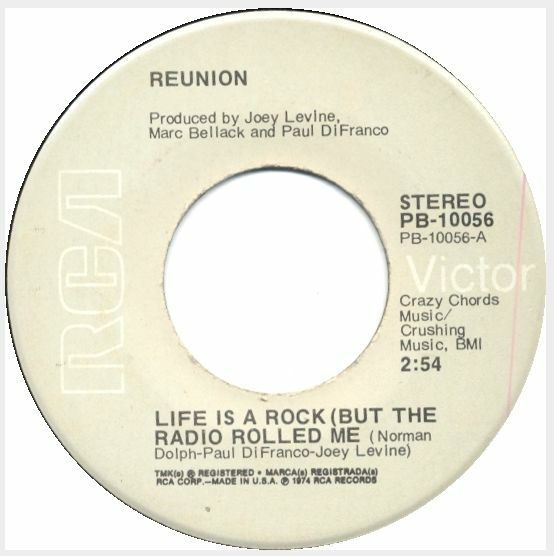 As for myself, I never was too enthralled with today’s Jukebox classic “Life Is A Rock (But The Radio Rolled Me)” by Reunion, and when it hit the airwaves in 1974 I never felt the need to rise to the challenge simply because I didn’t care. So how did this genuine novelty that climbed to the #8 slot on the singles charts in 1974 end up joining the ranks of the jukebox if it is a track I couldn’t stand the first time around? I’ll tell you in one word: “plastics…,” actually the word is “nostalgia.” As I have opined before, oftentimes the worst, most cringe-worthy pieces of trivial trash that were incessantly played on the radio go on to become the songs that make us feel warm and nostalgic for simpler times, and today’s jukebox classic certainly fits the bill for me. The song was written by Paul DiFranco and Norman Dolph several years before it was recorded by a studio incarnation called Reunion featuring Joey Levine on lead vocals. And if that name isn’t familiar to you, you’ll know some of the bubblegum classics his lead vocals have graced including “Chewy Chewy,” and “Yummy Yummy Yummy” by Ohio Express, “Quick Joey Small” by Kasenetz and Katz and “Run Run Run” by The Third Rail. When Levine joined the Reunion fray, he also received a writing credit on the record. After his success with Reunion, Joey Levine got into the commercial business writing such memorable jingles as “Sometimes You Feel Like A Nut” for Mounds, “Gentlemen Prefer Hanes” for Hanes underwear, “Just For The Taste Of It” for Coke, “Heartbeat Of America” for Chevy, “You Asked For It, You Got It, Toyota” for Toyota and “This Bud’s For You” for Budweiser beer. Today’s song has been covered by Tracey Ullman on her You Broke My Heart In 17 Places album and Rudy Crenshaw for the Disney album Mickey’s Dance Party. Chicago radio fans will also remember two versions of the song that were customized for local radio, including a version for WCFL with the late legendary Chi-town disc jockey Larry Lujack and one for WLS. 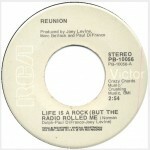 The WCFL version “Life Is A Rock (But CFL Rolled Me)” was the last song played on the station in 1976 before it changed formats, and the WLS version was the first song played on the station when it returned to the airwaves in June of 2008. The song was also repurposed for a McDonalds commercial campaign with a recitation of menu items taking the place of the original lyrics. Listen–remember, they’re playing our song! Several other Reunion singles were released with no chart action whatsoever, so the collective went their separate ways. They never even recorded an album. However for better or worse, the song seemingly did go on to inspire another chart-topping hit, “We Didn’t Start The Fire” by Billy Joel. Posted: October 25th, 2015 under Music, Reunion/Joey Levine, Rock.